A nagging problem has grown into a safety concern on the road and at the turnpike exit, and the long-term remedy may be building an Interstate 195 spur. 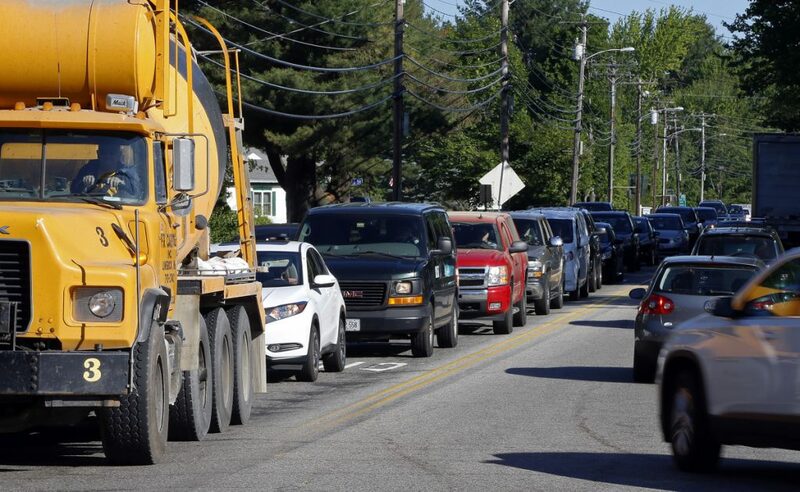 The way Saco Public Works Director Patrick Fox sees it, the hottest topic in town other than erosion in Camp Ellis is the traffic congestion that plagues Route 112, frustrating drivers and raising concerns about public safety both on local streets and the Maine Turnpike. The congestion – an issue for well over a decade – has worsened in recent years because of residential development in communities west of the city, and reaches a choke point near where traffic exits the turnpike onto Route 112. Now the city is partnering with the Maine Department of Transportation and Maine Turnpike Authority to look for long-term solutions, including the possibility of an Interstate 195 spur to reroute traffic out of the neighborhoods that commuters cut through to avoid busy intersections. The congestion is particularly acute during the morning and evening commutes on weekdays, when cars from Saco and towns to the west head to the turnpike interchange via Industrial Park Road. Nearly 20,000 cars travel through the corridor each day on average, including more than 18,000 that use Industrial Park Road, according to MDOT. Two intersections along Route 112 – with Garfield Street and Industrial Park Road – are considered by the department to be high-crash locations. In 2015 through 2017 there were 29 crashes at the Industrial Park Road intersection and 22 at the Garfield Street intersection. During the busiest commuting hours, traffic backs up from Industrial Park Road onto the main line of the turnpike. That’s a safety concern, especially along a stretch of turnpike used by 60,000 to 70,000 cars a day, said Erin Courtney, a spokeswoman for the turnpike authority. 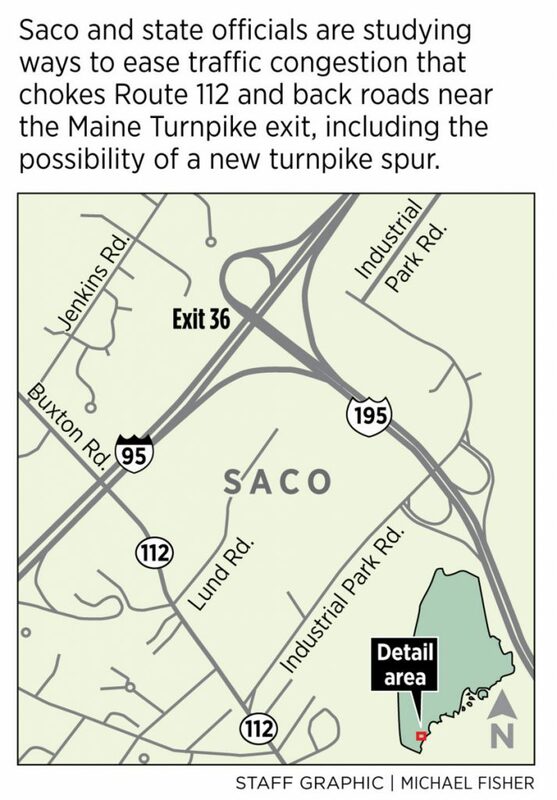 She said traffic sometimes backs up onto the turnpike at the southbound Biddeford exit, but not to the same degree as it does in Saco. The traffic jams at the intersection of Route 112 and Industrial Park Road are frustrating for drivers and a concern for emergency responders who need to get through that area quickly. The regular commuter traffic is exacerbated by the large number of tractor-trailer trucks that use Route 112 to get to Hollis and other towns in western York County. The city has studied traffic in the Route 112 corridor in the past, but this is the first time it’s being studied as a regional transportation issue instead of simply a Saco problem, Fox said. The city is paying 20 percent of the cost of the engineering study, and the turnpike authority and MDOT will pay the rest. The engineering study will look for long-term solutions to managing and improving access to Route 112 and making safety improvements at intersections. It also will look for ways to separate local and through traffic as much as possible. A final report is due in February. City Administrator Kevin Sutherland first floated the idea of an I-195 spur more than two years ago when the City Council was looking at traffic issues in the city. Currently, I-195 extends east from Exit 36 to Old Orchard Beach. If the engineering study determines a spur would be beneficial, officials would still need to determine its exact location and how to pay for it. Previous studies have identified high-crash locations, safety and livability issues on local streets that commuters cut through, traffic congestion at the toll plaza and on the turnpike, and the lack of bicycle and pedestrian lanes on Route 112. The city has already tried to address the traffic congestion by identifying the most problematic areas, adding turn lanes and installing state-of-the-art traffic signal equipment to better control traffic flow. Fox said the city will continuously update residents on the study and will hold a second public comment session in October. The city website now includes a specific section about the Route 112 issue.